STUTTGART, GERMANY – 15 NOV 2017 — Intland Software, developer of market-leading Application Lifecycle Management software platform codeBeamer ALM announced the release of their tool’s latest version 9.0. The release brings enterprise features to support the collaborative development of quality software products. The advanced Variants Package functionality introduced in codeBeamer ALM 9.0 supports product line management by enabling users to manage the parallel development streams of multiple product variants. The feature supports branching, merging, branch comparison, and baselining. By efficiently managing product commonality and variability, the Variants Package helps users optimize reuse and cut development costs. codeBeamer ALM 9.0 offers safety-critical developers an Audit Trail dashboard to simplify compliance audits. This comprehensive dashboard draws on ALM data to provide a history of items and processes in a single report, reducing preparation times for compliance audits. The new release introduces conversation-driven development via ChatOps. Integrating with chat apps (Slack and Mattermost), codeBeamer’s ChatOps functionality brings the power of ALM right into the chat window. Chat bots help users execute tasks in the ALM tool using simple chat commands, enabling them to efficiently collaborate any time, anywhere, on any device. The integration with enterprise chat app Slack connects codeBeamer ALM to AI systems, PDM and PLM platforms, and dozens of other tools, and is available free of charge during the early access period. codeBeamer ALM is now connected to the Tasktop Integration Hub, extending its list of out-of-the-box integrations with 50+ development platforms (including IBM RTC, CA Agile Central, Jama, VersionOne, Polarion, HPE ALM, and more). Further improvements to its integrations include a refactored JIRA Connector (free during the early access period), as well as Kubernetes and Docker integrations for DevOps teams. 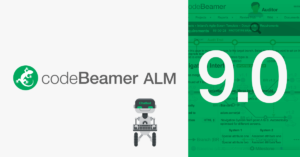 With significant usability updates, advanced filtering and view options are now available in this latest release of codeBeamer ALM 9.0. Customizable views enable the granular filtering of lifecycle data, giving users a tool to easily access important information. This new release is now available. codeBeamer ALM is an integrated Application Lifecycle Management tool that supports the development of complex software products in any enterprise development environment. It is fast, scalable, integrates well with other tools, and is preconfigured for compliance in safety-critical development.